The "Hampi of Central India"
Sometimes referred to as the Hampi of central India because of its treasure trove of ruins, Mandu is one of the top tourist places in Madhya Pradesh, yet is still delightfully off the beaten path. This abandoned city from the Mughal era is spread over a 2,000 foot-high hilltop, and surrounded by a 45 kilometer stretch of wall. Its spectacular main entrance, located to the north, faces Delhi and is called Dilli Darwaza (Delhi Door). Mandu's history stretches back to the 10th century when it was founded as the fort capital of the Parmar rulers of Malwa. It was subsequently occupied by a succession of Mughal rulers from 1401 to 1561, who set up their indulgent kingdom there, resplendent with exquisite lakes and palaces. Mandu was invaded and captured by Mughal Akbar in 1561, and then taken over by the Marathas in 1732. The capital of Malwa was moved to Dhar, and the decline of Mandu's fortunes began. Yet, the importance of Mandu's heritage and the consistent efforts being made to preserve it haven't been overlooked. In September 2018, the Indian government jointly named Mandu as Best Heritage City in India at its 2016-17 National Tourism Awards. Mandu is located around two hours drive southwest of Indore, on greatly improved roads. The easiest way of getting there is to hire a car and driver from Indore (arrange for one to meet you at the airport, as Indore isn't an appealing city for tourists and there's no need to spend much time there). However, it's also possible to take a bus to Dhar and then another bus to Mandu. Indore is easily reachable both by domestic flight in India, and Indian Railways train. The cool and dry winter months from November to February are the best time to visit Mandu. The weather starts heating up by March, and gets very hot during the summer months of April and May, before the monsoon arrives in June. See more about the weather in Madhya Pradesh. Mandu's magnificent palaces, tombs, mosques and monuments are divided into three main groups: The Royal Enclave, the Village Group, and Rewa Kund Group. Tickets for each group cost 300 rupees for foreigners and 25 rupees for Indians, effective August 2018. There are other smaller, free, ruins scattered across the area as well. By far the most impressive and extensive is the Royal Enclave Group, a collection of palaces built by various rulers around three tanks. The highlight is the multi-level Jahaz Mahal (Ship Palace), which apparently used to house Sultan Ghiyas-ud-din-Khilji's substantial harem of women. It appears evocatively illuminated on moonlit nights. Most centrally-located, in the heart of Mandu's marketplace, the Village Group consists of a mosque that's considered to be the finest example of Afghan architecture in India, and Hoshang Shah's tomb (both of which provided inspiration for the construction of the Taj Mahal centuries later), as well as Ashrafi Mahal with its detailed Islamic pillar work. The Rewa Kund Group lies four kilometers to the south, and is made up of Baz Bahadur's Palace and Rupmati's Pavilion. This spectacular sunset spot overlooks the valley below. 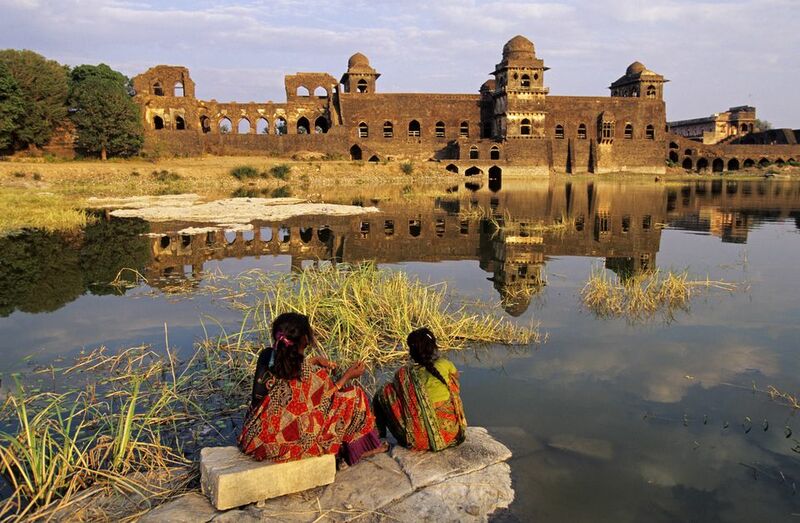 It's famous for the legendary and tragic romantic tale of Mandu ruler Baz Bahadur, who had to flee from Akbar's advancing troops, and beautiful Hindu singer Rupmati. The 10 day Ganesh Chaturthi festival, which commemorates the beloved elephant god's birthday, is the biggest celebration in Mandu. It's an interesting blend of Hindu and tribal culture. Accommodations in Mandu are limited. Hotel Rupmati and Madhya Pradesh Tourism's Malwa Resort are the two best options. The Malwa Resort has newly renovated cottages and luxury tents in lush green surroundings, starting from 3,290 rupees per night for a double. Alternatively, Madhya Pradesh Tourism's Malwa Retreat (near Hotel Rupmati) is a cheaper and more centrally located option. It has air-conditioned rooms and luxury tents for 2,590-2990 rupees per night, and beds in a dorm room for 200 rupees per night. Both are bookable on the Madhya Pradesh Tourism website. Mandu is a peaceful place to relax and its sites are best explored by bicycle, which can easily be rented. Take three or four days to leisurely ride around and see everything. The Bagh Caves, located around 50 kilometers from Mandu on the Baghini river bank, are a series of seven Buddhist rock cut caves dating back to 5th-6th centuries AD. They've been restored in recent years, and are worthwhile seeing for their exquisite sculptures and murals. Maheshwar, the Varanasi of central India, can also easily be visited on a day trip. However, it's worth staying a night or two there if you can.